Jeffrey Grossman believes that for a very long time we have been observing coal from a totally wrong perspective. He stresses the necessity to explore the real value of the complex chemistry and diversity of the material, instead of just ignoring its molecular complexity and setting it afire. Grossman and his team of researchers highlighted the possibility of coal becoming the foundation for electronic devices, batteries, or solar panels. Grossman, doctoral student Brent Keller, and research scientist Nicola Ferralis demonstrated the wide variety of high-tech uses for this conventionally low-tech material. They successfully developed an electrical heating device to defrost airplane wings or car windows. This device could also be used as part of a biomedical implant. In addition to developing this initial application, the team has also specified in detail the optical, electrical, and chemical properties of thin films of four coal varieties, such as two bituminous types, lignite, and anthracite. A report on their findings has been published in NanoLetters. When you look at coal as a material, and not just as something to burn, the chemistry is extremely rich. The question he wanted to ask is, "Could we leverage the wealth of chemistry in things like coal to make devices that have useful functionality?” The answer, he says, is a resounding yes. A discovery has been made on the fact that naturally available coal types, without the refining or purifying processes to develop electronic devices from silicon, have a variety of electrical conductivities that spreads across ten million times or seven orders of magnitude. This means that any coal variety could provide the electrical properties required for a specific component. Grossman states that one part of the challenge focused on how the material can be processed. For this Keller came up with a number of steps that could help to crush the material into a powdery form, this is then added to a solution followed by depositing it in thin uniform films placed on a substrate. This is a vital step when producing a number of electronic devices, ranging from transistors to photovoltaics. For centuries, coal has been one of the most common substances used by human beings. Despite this fact, the material’s optical and electronic properties have never been studied for advanced devices. The material has never been approached this way before, to find out what the properties are, what unique features there might be. To do so he developed a method for making thin films, which could then be tested in detail and used for device fabrication. The team points out that this newly developed in depth characterization is considered to be the tip of a big iceberg. The four types of coal selected here represent only a few of the hundreds that still exist, and are available with significant differences. Materials scientists considered the process of preparing and testing the samples right from the initial stages to be an unfamiliar process. We usually want to make materials from scratch, carefully combining pure materials in precise ratios, selecting from among this huge library of materials [all with their own different variations]. For a long time, coal and a variety of fossil fuels have been utilized as feedstocks for the chemical industry. They have been used to make everything from plastics to dyes and solvents. Traditionally coal was treated like other varieties of raw ore, which is capable of being refined into its fundamental constituents, simple molecules, or atoms, which are later merged to develop the desired material. Using the chemistries provided by nature without making any changes is a very unusual approach. The researchers discovered that by just modifying the temperature under which coal is processed, they could actually alter most of the material’s electrical and optical properties based on the desired values. The team’s simple heating device extensively demonstrates how to use the material, starting from grinding the coal, then depositing it as a thin film, and finally developing in into an operational electronic device. The researchers have made room for a wide range of potential applications through additional research. Grossman says that the most promising advantage of the new material is its low cost, originating from the existing inexpensive base material, incorporated with simple solution processing that helps low fabrication costs. 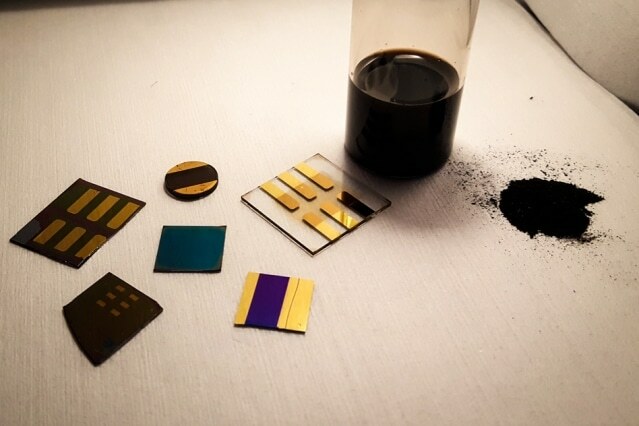 The purification of graphene or chip-grade silicon is a very expensive process. Silica, the raw material used for silicon chips, is inexpensive and available in abundance, but the highly refined form required for electronics (typically 99.999 percent pure or more) is expensive. The high conductivity, adjustable properties, thermal stability and robustness of powdered coal, provides the material with a wide range of applications. Grossman states that the work was successfully executed with the help of a grant from the Bose Fellows Program at MIT, which promotes this kind of high-risk research undertaken by the researchers of this project. The work also received support from ExxonMobil through the ExxonMobil Energy Fellow Program and the MIT Energy Initiative.